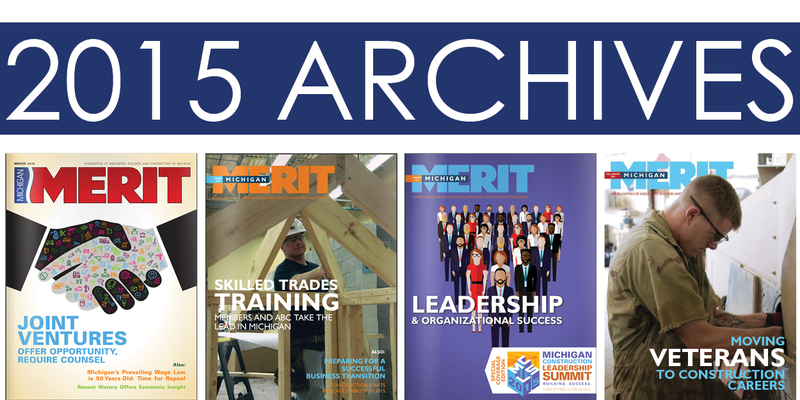 Click on each box below to read back issues of Michigan Merit. ABC of Michigan members will receive one copy of Michigan Merit to the primary contact at the company. Contact ABC at info@abcmi.com or 517.853.2545 to be added to the mailing list. ABC of Michigan is a statewide trade association representing the commercial and industrial construction industries. Dedicated to open competition, equal opportunity and accountability in construction, ABC members develop people, win work and deliver that work safely, ethically, profitably and for the betterment of the communities in which ABC and its members work.